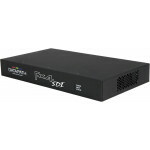 Datapath VisionIO-SDI4 capture card offering the ability to capture high quality video and loop inputs directly to outputs, creating latency at just a few pixels. Signals are delivered to the primary display, even if the host PC stops functioning. The VisionIO series also offers an on-board alpha blending capability, allowing a secondary source of frames to be overlaid on to the outgoing display in real time. The optional use of an overlay watchdog ensures that the application supplying the overlay is in constant control. If any problems are detected the card will ensure integrity of the primary signal by preventing the overlay from obscuring the live signal.